Name: Tyrannosaurus rex (pronunciation: "tie-RAN-oh-SAW-rus") - The name means "Tyrant Lizard King"
Despite its popularity, T. rex only existed for about 2 million years. It lived for a short time period around 68 to 65 million years ago. Extinction: T. rex was one of the last dinosaurs to ever exist. It went extinct at the end Cretaceous mass extinction event, which brought a close to the age of Dinosaurs. T. rex was originally discovered by Barnum Brown in 1900 while doing excavations in Wyoming. However, Brown thought the fossil was something else. Osborn, in 1905 caught the error and names it T. rex. 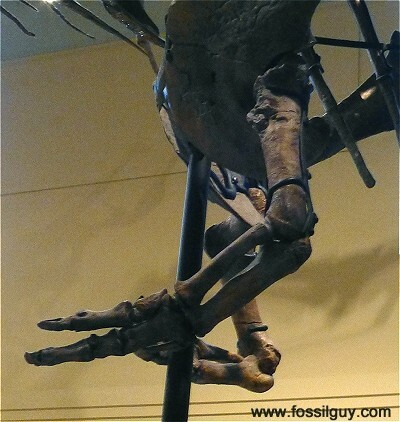 The Holotype specimen, CM 9380 (AMNH 973), is at the Carnegie Muesuem of Natural History in Pittsburgh. Despite its popularity, T. rex only lived on an island continent called "Laramidia". This continent is present day Western North America. Body Size: Pretty Big! 13 meters (42.6 feet)! Although T. rex was not the largest carnivour, it was pretty substantial. T. rex could reach a length of over 40 feet and weight over 7 tons (equal to 93 people). The largest specimen is Scotty. She is 13m (42.6ft) in length. Bone Crushing Bite: Strongest Bite of any Land Animal... Ever! T. rex had MASSSIVE jaws with HUGE muscles. It had the strongest bite of any animal ever! One tooth could produce up to 12,800 pounds of force! T. rex was the Apex predator of the Western United States. It could eat just about anything. Ceratopsians (triceratops) and Hadrosaurs (duck-billed dinosaurs) were amung its favorites. Evidence shows it even ate other T. rex's! Recent studies indicate T. rex could run at speeds over 18 mph! The discovery of skin impressions of a T. rex in 2002 reveals scales, not feathers. 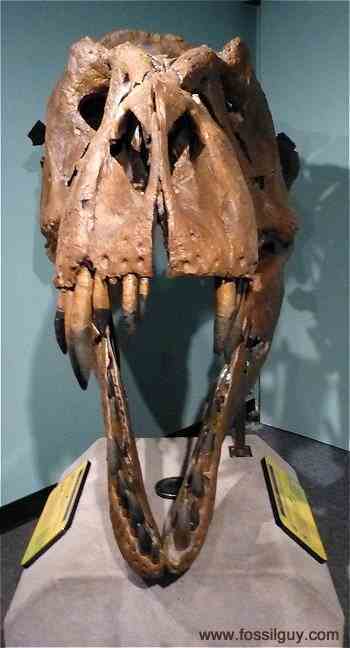 This is the large skull of "Tufts Love T. rex" when it was being prepped at the Burke Muesum in Seattle. Tyrannosaurus rex is one of the largest and most popular members of the Tyrannosaurus family of dinosaurs. This is this is probably because it was one of the most dangerous predators to ever walk earth. T. rex is characterized by an oversized head with foreword facing eyes, huge muscular jaws, robust serrated teeth, a powerful tail, and tiny arms. T rex was the apex predator of its time. It was a powerful carnivore that hunted many other large dinosaurs including the Ankylosaurs, Triceratops (Ceratopsids), Hadrosaurs, and the last of the Sauropods. Although Tyrannosaurs have a long history, the species, T. rex, lived for a short time period of about 3 million years during the very end of the Cretaceous. It was the last of the Tyrannosaurs. The first fossils are around 67 million years old and the last fossils are 65 million years old. Tyrannosaurs went extinct with the rest of the dinosaurs during the end Cretaceous mass extinction event. T. rex only lived on the small island continent of Laramindia (now western North America). 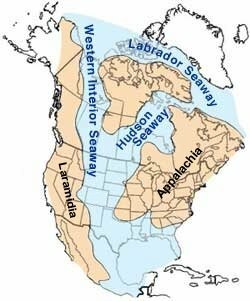 During the Cretaceous, a large seaway (the Western Interior Seaway) split North America in half. The western half of North America is called Laramindia and the eastern half is called Appalachia. Fossils of T. rex from Laramindia are found from Canada down into Texas. T. rex shared this island continent with many other well known clades of dinosaurs including the hadrosaurs, and the ceratopsids, such as Triceratops. Isolated teeth and isolated bone fragments of T. rex are common, however, associated specimens are rare. Under 60 partial specimens have been described by science. (Here is the list). Among these specimens, only 13 are over 25% complete. 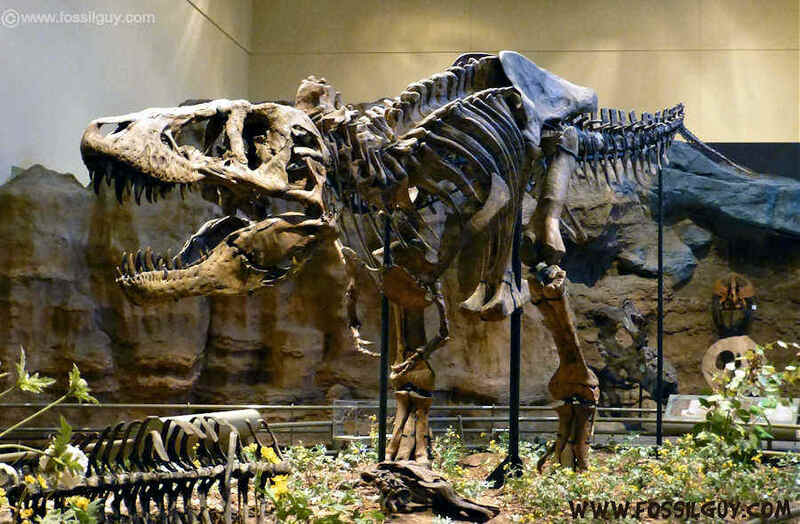 The most complete T. rex is called "Sue" (PR2081), which was found in 1990 in South Dakota. 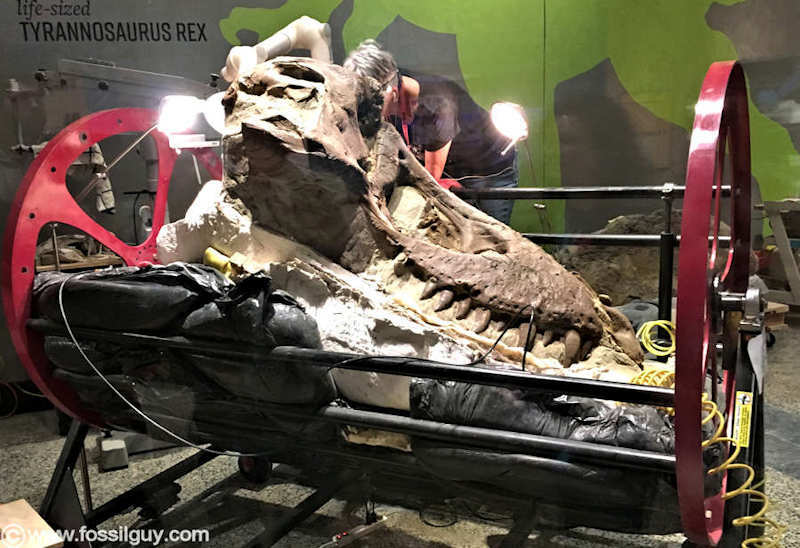 Sue is 80% complete and can be seen in the Field Museum of Chicago. Map of the Late Cretaceous of North America. The continent was split into two island continents by the Western Interior Seaway. The West was called Laramidia and the East was called Appalachia. Both island continents had different Dinosaur fauna. T. rex was confined to Laramidia. Image by the U.S. Geological Survey. T. rex is a very specialized dinosaur with many unique anatomical features. These next paragraphs highlight some of the main features of this apex predator: T. rex could crush other dinosaurs bones, it actually used its tiny arms, and it was fast and agile! Prior to 2018, T rex skeletons were mounted as sleak looking dinosaurs, however, paleontologists working with SUE (the most complete T rex found to date) at the Field Museum in Chicago figured out where the placement of a series of rib-like bones go. These gastralia bones go under the ribs of T-rex, on it's belly and aided in the dinosaurs breathing. The addition of these gastralia bones makes SUE have a bulging belly and widens it's rib cage. 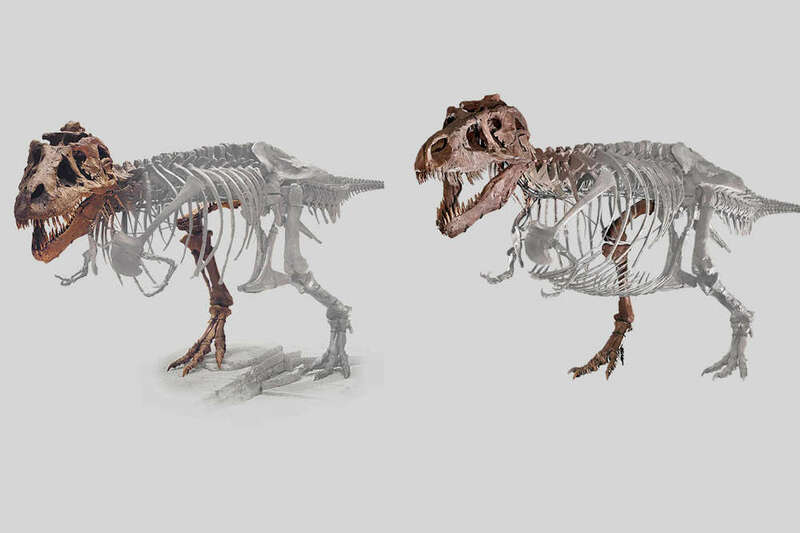 A comparison of the old mount of SUE and the new mount are shown below in this Field Museum image. Here is a video from the Field Museum showing SUE's new look with the gastralia bones added. Tyrannosaurus rex's Huge Skull and Powerful Bite! - "T. rex the Bone Crusher"
Compared to other theropod dinosaurs, Tyrannosaurus rex had the largest, most robust, and most powerful skull. It was clearly specialized. T. rex underwent dramatic skeletal changes as it grew from a hatchling into a full grown adult. The skull starts out very slender with a somewhat long snout. However, as it aged, the skull became significantly larger, the snout became blunt, and the jaws became very robust. By looking at an adult T. rex skull and comparing it to other theropods of the time, one can tell the jaws would have been much more muscular. In 2012, Bates did a computer study of the bite force of a human, Allosaurus, juvenile T. rex, and an adult T. rex (STAN-BHI3033). The study was much more accurate than previous estimates because they used "dynamic musculoskeletal models" to simulate the maximum bite forces of the animals. Bates found juvenile T. rex had a small bite force, indicating a diet of small prey. While adult T. rex had an incredibly powerful bite force, much higher than other theropods. The bite force was found to be between 35,000 and 57,000 Newtons per tooth (up to 12,800 pounds of force per tooth) (Bates, 2012). In laymans terms, Bates says, 12,000 lbs is the equivalent of an elephant sitting on a person! T. rex bite force is MUCH more powerful than any other land animal EVER. While other theropods, like Allosaurus and juvenile T. rex's probably couldn't chomp through bone, an adult T. rex could crush any bone with ease. It could have fed on even the largest dinosaurs. Dr. Bates concludes the extremely powerful bite makes "it one of the most dangerous predators to have roamed our planet." 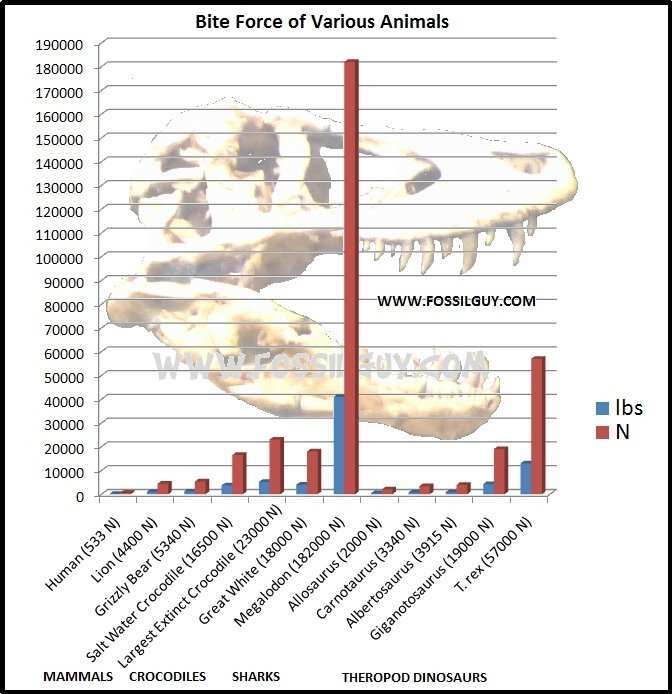 This graph shows the bite force of T. rex compared to other animals, including similar theropods, crocodiles, some mammals, and the creature with the largest bite force known, C. megalodon. Bite force values of the reptiles are from: Erickson, et al. (2012). The Sharks are from: Wroe, et al. (2008). Most dinosaurs from this table are from: Bates and Falkingham (2012). Tyrannosaurus rex's Tiny Arms - Specialized, not useless. T. rex 's arms are probably the most perplexing feature of this terrifying dinosaur. For a 40 foot animal, they are only about the length of human arms. While other theropods, such as the Ornithomimosaurs, were developing long arms, all of the large Tyrannosaurs across the globe had developed very short and stubby arms. A quick look makes many people think they were useless and vestigial, and therefore they simply shrunk in size. However, the rest of T. rex 's anatomy appears to have been highly specialized. It would be strange to see a very specialized body plan that contains small useless arms. A closer look at the few fossil arms of T. rex show they still had large menacing claws on their remaining two finger digits; they did not reduce in size. Also, Lipkin and Cerpenter (2008) found that T. rex arms were actually incredibly powerful and muscular. An image of very muscular, shortened arms with large claws shouts specialization. They were not vestigial. If they were highly specialized, like the rest of T. rex's anatomy, the question becomes what were these strong, sharp tooth picks used for? This is a diagram of a Tyrannosaurus rex arm. This work is by Conty (Public Domain). Rothschild and Molnar (2008) investigated Tyrannosaur arms. They looked for stress fractures in the arms of T. rex and found that stress fractures were common. What's the big deal about stress fractures? A stress fracture is different from a break. Stress fractures occur during high impact and repeated activities. For example, stress fractures are not uncommon in people training for a marathon. Stress fractures occur with extensive use or overuse, not because of trauma. This means T. rex was actively using its arms for something. So, what did T. rex use its arms for? This is where speculation comes to play. They could have been used for some sort of mating behavior. Perhaps they helped T. rex go from a sitting to standing posture, or maybe they could have been used to stick into struggling prey. The speculation goes on and on. Rothschild and Molnar (2008), tried to takle this question. When looking at predators, stress fractures occur in their limbs when holding onto struggling prey. Previously, in 2001, Rothschild and others studied the numerous stress fractures in the limbs of Allosaurus, a Jurassic theropod. They concluded this theropod actively used its arms and legs to hold and grasp struggling prey. Rothschild and Molnar came to the same conclusion about T. rex's arms, that holding onto struggling prey could cause this type of injury. Short muscular arms with large claws could hold the prey steady while the giant, bone crushing, jaws tore through the struggling dinosaur. Lipkin and Carpenter (2008) also support this. They note that the many injuries to the dinosaurs' shoulders were probably the result of predator-prey interactions. So, based on the research, what were T. rex arms used for? To hold onto struggling prey. How fast could T. rex run? We don't know, but it was built for agility and speed. Figure 2 from Sellers & Manning (2007). Click on the link to view the full article. This figure shows body mass vs top speeds from the simulations. Tyrannosaurus rex is on the far right. The fastest theropod on thier chart is Compsognathus, a tiny 1m long critter. The best way to gauge the speed of a dinosaur is to study dinosaurs tracks. Unfortunately, there is a lack of Tyrannosaurus tracks. There have been a few isolated foot prints found in the western U.S. and Mongolia, but these isolated footprints tell us nothing about the dinosaurs speed. There have only been two trackways discovered so far. 1: The first trackway is from British Columbia. It was excavated between 2011 and 2012 and published in 2014 (McCrea et al, 2014). This track way consists of 3 individual Tyrannosaurs walking together. Based on the gate of one of the track ways, it has been deduced that one of the tyrannosaurs was walking between 6.5 - 8.5 km/hr (4 - 5.3 mph) (McCrea et al, 2014). Unfortunately, this track way is of a Tyrannosaurs walking, not running. So the running speed from this trackway cannot be determined. 2: The second trackway is from the Lance Formation in Wyoming. It was discovered near the Paleon Museum in Glenrock years ago, and with the help of Scott Persons, was recently researched and published on. 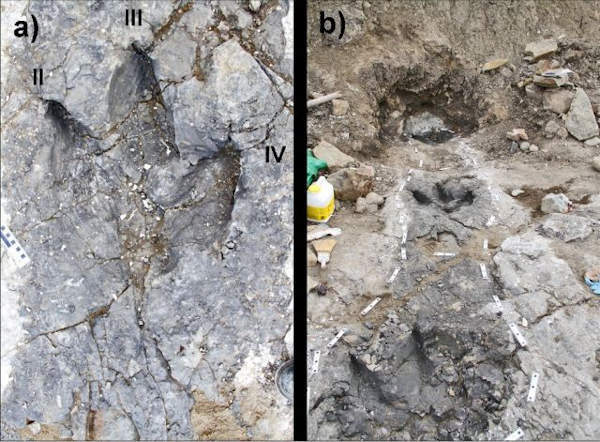 These tracks are either of a juvenile T. rex or a Nanotyrannosaurus (Smith et al, 2016). Calculations based on the tracks give a speed of between 4.5 and 8 km/h (2.8 mph and 5 mph) (Smith et al, 2016). Like the previous tracks, these tracks are of a fast walking or trotting dinosaur. So, again, the running speed of a T. rex cannot be determined. However, when compared to other dinosaurs, T. rex, had a faster walking / trotting speed than other large herbivores, including its prey, the duckbilled dinosaurs (Smith et al., 2016). Until further trackways are found, we must rely on other methods to deduce the maximum speed of a Tyrannosaur, such as the anatomy and physiology of the legs and tail, as discussed below. 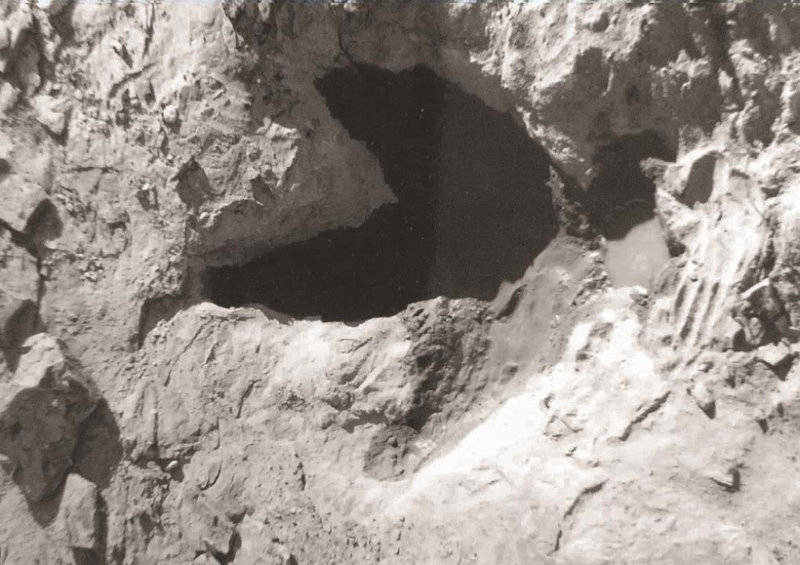 Image of one of the Tyrannosaurus' tracks. Photo by Scott Persons, one of the papers authors: Smith et al, 2016. In the past, T. rex was thought of as a slow and cumbersome dinosaur. It was often thought that due to its size, overcoming its own inertia would be difficult to do. If it could not move as fast as its prey, T. rex would be a terrible hunter, and would therefore need to resort to scavenging. Walking speeds from the two trackways gives walking speeds around 3-5 mph, but say nothing about it's running speed. This is where musculoskeletal models come into play. Figure 9 from Persons & Currie 2010. Click on the link to view the full article. This figure shows the reconstructed tail musculature. The M. caudofemoralis muscle is the main retractor muscle of the hind limb. A larger retractor muscle indicates a faster animal. Tryannosaurus had a large M. caudofemoralis. 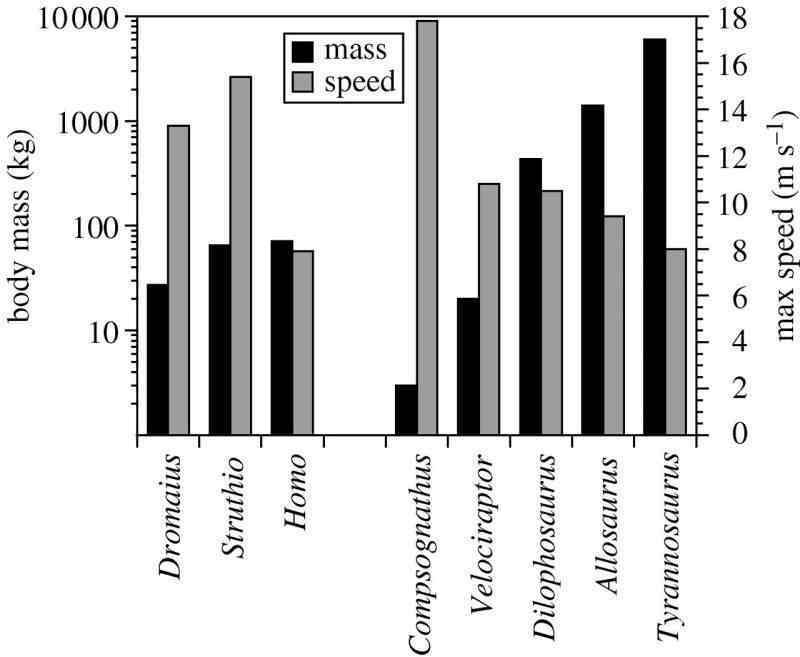 A paper published in 2007 by Sellers and Manning shows that T. rex was not terribly slow. They developed musculoskeletal computer models of three living animals (including a human) as well as for five theropod dinosaurs. The speeds calculated for the three living animals were "in reasonably good agreement with accepted values." For the theropods, they found the smaller ones were the fastest, while T. rex was the slowest. Although it was the slowest, the speed found was still a respectable 8 m/s (18 mph), which is faster than a sprinting human or an elephant. A table of their data is shown above. Sellers and Manning conclude that improved musculoskeletal models will produce even more accurate values. 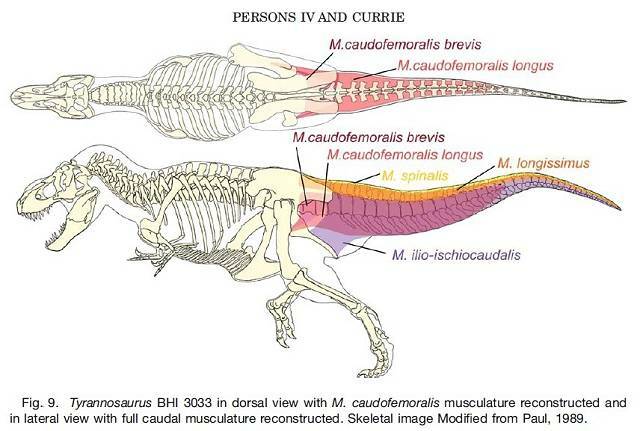 Later, in 2010, a more accurate T. rex musculoskeletal model was created by Persons and Currie. They looked at both the leg structure and the unique tail structure of theropod dinosaurs. Theropods have tails with a structure unlike any living animal today. Persons and Currie realized the tails weren't simply a large counterbalance, but an extension of the dinosaur's leg muscles. Some of the large tail muscles gave extra power to the dinosaurs' legs. These extra muscles also added mass to the tail which would help center the inertia of the animal (center of mass). They say Tyrannosaurus had a "sizeable investment in locomotive muscle among theropods." They concluded that Tyrannosaurus had greater athleticism, in terms of running, balance, and turning agility. This evidence suggests a much more mobile and agile animal capable of chasing down prey (Persons and Currie, 2010). In light of this new evidence, it appears T. rex may have been able to move a little faster than the 18 mile per hour value given by Sellers and Manning. T. rex also has proportionately longer legs than other theropods, enabling it to have a longer stride and faster gate. So, when all the evidence is considered, it appears T. rex's legs and tail were specialized for agility and speed. Was Tyrannosaurus rex a Predator or Scavanger? The debate as to whether or not T. rex was a predator or scavenger is not really a big debate. Most paleontologists agree that T. rex was an opportunistic carnivore. This conclusion is not only drawn from fossils but also from looking at predators today. There is no black and white line that separates a "predator" from a "scavenger." Nature is not that clear cut. To clarify, one can take a look at living carnivores. A good example is the lion and hyena. The lion is traditionally thought of as an apex predator in southern Africa. However, even though a typical lion will hunt and kill over 15 animals per year, up to 40% of a lions food comes from scavenging carcasses. On the flip side, the hyena is traditionally thought of as a scavenger. However, it has been found that many hyenas hunt for most of their food. In fact, the spotted hyena hunts and kills as much as 95% of its own food (Cooper et al. 1999), way more than a lion. Based on the facts, a hyena is much more of a predator than a lion. However, neither is a pure predator or scavenger. They are opportunistic carnivores. If one researches almost any apex carnivore, one will find they are a mix of both. So, it doesn't really makes sense to group T. rex as only a predator or scavenger. Like most carnivores, it was probably a mix of both. How much it hunted vs scavanged will never be known. However, science tells us T. rex is designed as a preditor, so it's reasonable to assume it would hunt it's share of food. Below discusses some of the preditor traits T. rex has. A cast of a T rex skull at the Academy of Natural Sciences in Philadelphia. Although the skull is slightly crushed, one can see the eyes clearly look forward. This is a key trait of most active hunters. Physical trace evidence of T. rex either hunting or scavenging is sparse. There have been many dinosaurs found with tooth marks, tooth pieces, and bite marks from T. rex. A study of T. rex marks on Triceratops horridus specimens even show how T. rex would have eaten them... by pulling their heads off! There have been many digested dinosaur bones found at fossil T. rex sites (stomach contents). Bite and scrape marks from T. rex have even been found on the bones of other T. rex (Farke, et al., 2010). This means they ate each other! However all of this evidence simply shows T. rex ate dinosaurs; it doesn't tell us if T. rex hunted them or scavenged them. However, a paper by DePalma et al (2013), studied a T. rex tooth embedded in a hadrosaur caudal (tail) vertebra. The interesting thing about this embedded tooth is the tail vertebra began to heal over. This means T. rex bit into a living hadrosaur. DePalma's team believes the T. rex intended to eat the hadrosaur, but it managed to escape. Besides the sparse trace evidence of predation, one can study the actual anatomy of T. rex itself and see if it was more suited as a predator or scavenger. Looking at the various specialized body parts suggests it was a well designed predator. T. rex has a huge skull with large, impact resistant teeth. The jaws had the strongest bite force of any land animal ever. Paleontologists argue these overly strong jaws and solid teeth would be ideal for capturing and holding struggling prey, even a large hadrosaur or triceratops. T. rex's eyes are the eyes of a predator. The dinosaur has foreword facing eyes, not eyes on the sides of the head. Foreword facing eyes gives an animal depth perception and is a key trademark of predators. As we now know, the tail of T. rex contains an abnormally large muscle which would have given T. rex increased speed and agility. In 2014 a paper was published by McCrea et al., discussing the first ever discovered trackway of a Tyrannosaurus. The interesting about this trackway is that it was made by 3 Tyrannosaurs next to each other at the same time (McCrea et al, 2014). This shows some kind of "gregarious" or social behavior, which lends credibility to Tyrannosaurs hunting in packs. Figure 2 from Carbone et al (2011). 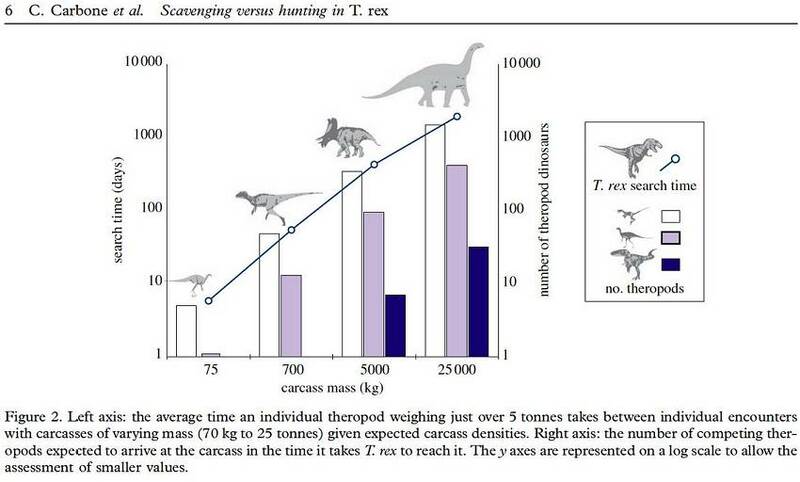 This shows the average time a T. rex would find a carcass compared to smaller dinosaurs. What it shows is by time the T. rex found a carcass, it would already be scavanged by the many smaller dinosaurs. Instead of looking at the actual fossils, another team (Carbone, et al. 2011) took a different approach to the hunter vs scavenger debate. They looked at T. rex in an ecological context, and studied the environmental conditions of the late cretaceous. Carbone and his teams intensive study looked at the mass and abundance of each carnivore and herbivore that coexisted with T. rex. They looked at their population densities and related it to a modern day ecosystem to calculate number of large carcasses available for T. rex to eat. They contend that smaller, more abundant carnivores would have quickly consumed carcasses, and that large carcasses would have been rare (Carbone, et al., 2011). The results suggest T. rex would have been unable to compete as a scavanger and would have had to hunt large prey (Carbone, et al., 2011). If T. rex wasn't a predator, there would have to be another top apex predator. None have been found. Predatory evidence from studying the anatomy of T. rex, the healed hadrosaur vertebra, and the ecological study is hard to refute. In light of this research, it seems clear that T. rex was an active predator. However, like apex preditors today, it probably exhibit both predatory and scavenging behaviors. Just how much T. rex hunted vs. scavenged will probably never be known, and it probably varied by the environmental conditions it lived in. What is known is that T. rex was at the top of the food chain in Western North America during the late Cretaceous. Casts of Jane, a nanotyrannosaurus, and Pecks Rex, a tyrannosaurus. Today, paleontologists realize that juvenile dinosaurs do not look like their adult counterparts. Besides the drastic size change, the skulls and other bones morphed and changed shape. Sometimes the youngsters look nothing like the adults. This makes determining a juvenile species of a particular dinosaur very difficult. In the past when different looking skulls were found, they were named a new genus and or species. Now, paleontologists have the daunting task of determining which species are valid and which species are simply juveniles of an already known adult species. A good example is famous ceratopsian, Triceratops. Back in the day, there were 16 species of Triceratops. Today, there are only 2. The other 14 "species" turned out to be juveniles in different stages of growth. This juvenile vs adult issue might also be present in T. rex. The problem is there are not enough fossils to study. Adult T. rex fossils are hard to come by, but it appears juveniles are even more difficult to find, especially when no one is sure what they exactly look like. In 1946 Charles described a skull of a small theropod that was eventually named Nanotyrannosaurus lancensis. This small skull was long and slender with many small sharp teeth. Later, in 2001, a nearly complete specimen of N. lancensis was discovered. This specimen is called "Jane" (BMRP 2002.4.1). The fact that no juvenile T. rex fossils had been discovered raised suspicions that Nanotyrannosaurus was actually a juvenile T. rex. Some paleontologists took a second look at Nanotyrannosaurus. They studied the holotype and concluded it was in fact a juvenile T. rex. Much of this was based on age determination of the fossil. Other paleontologists studied the skull and came to the conclusion Nanotyrannosaurus was its own species and not a juvenile T. rex. Much of this was based on the fact that a closely related species (Tarbosaurus bataar of Asia) did not lose teeth as they aged, but for N. lancensis to be a juvenile T. rex, it would have had to lose many teeth. The debate still goes on today. The problem is there is simply not enough study material to validate any assumption. Other "juvenile" specimens have been found. Unfortunately, they are in private collections and are unavailable for study. Juvenile T. rex's were obviously much smaller, and probably less robust than the adults. This means they probably occupied a different ecological niche than their adults. But is Nanotryrannosaurus a juvenile T. rex? For now, Nanotrannosaurus lancensis is officially a different species than Tyrannosaurus rex. The debate will not be settled until new fossil specimens are found and studied. Did T. rex have feathers? It was either fully scaled or mostly scaled. Illustration by Lida Xing and Yi Liu. Since the discovery of feathered dinosaurs in the 1990's, it has become clear that many families of theropod dinosaurs had feathers, or at least, primitive feather like structures (protofeathers). Well known theropods such as velociraptor and microraptor had protofeathers. Tyrannosaurus is a very large theropod, so could it have also had feathers? To answer this question, one needs to look at the Tyrannosaur family and see if any of its relatives had feathers. As it turns out, its relatives do have feathers. In 2004, a theropod named Dilong paradoxus was discovered in China (Xu X. et al 2004). Dilong, a small 1.6 m theropod, was found to be covered in protofeathers; the "feathers" looked like hair like strands (Xu X. et al 2004). Dilong is also considered to be a distant member of the Tyrannosaurid family that lived 65 million years before T. rex. This means protofeathers are present in Tyrannosaurus' family tree. Later, in 2012, Xu X. described another nearly complete feathered Tyrannosaur relative named Yutyrannus huali (Beautiful Feathered Tyrant). This theropod is a little younger in age, about 125 million years old, and is more closely related to T. rex than Dilong. What's interesting about Yutrannus is that it's 30 feet in length. Although it's still smaller than T. rex, it's the largest feathered theropod yet discovered. The simple feathers on Yutrannus are not well preserved, but they are up to 8 inches long and may have covered most of the body (Xu X. et al, 2012). This discovery showed that even large theropods could be covered in feathers, or feather like structures. 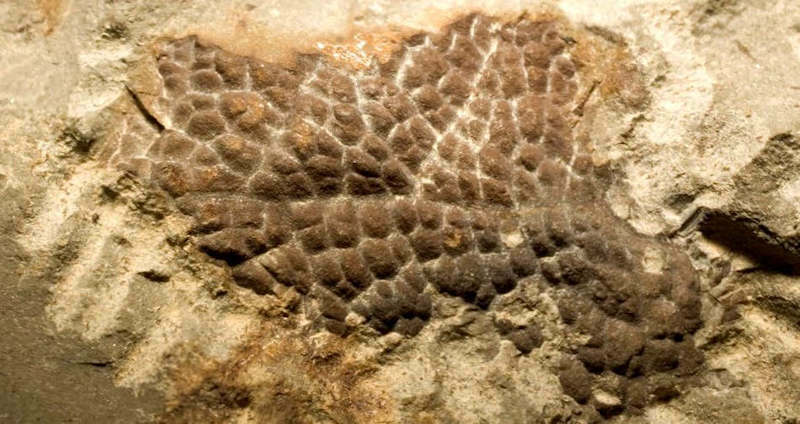 Image of a skin impression from the tail of "Wyrex" tyrannosaurus dinosaur (BHI 6230). As one can see, at least this part of the Tyrannosaurus rex had scales and not feathers. However, as tantalizing as it is, one cannot conclude that T. rex had protofeathers. A well preserved T. rex specimen found in 2002 named "Wyrex" (BHI 6230) was found with some small associated skin impressions from the neck, hip, and upper tail. All of the impressions clearly show intricate scales. No feather or hair like structures are seen. In places on the body where Yutrannus shows feather structures, T. rex only shows scales. So, it can be concluded that T. rex was covered scales, not feathers. One difference between Yutrannus and T. rex is the climate in which they lived. Yutrannus is from China and lived in a colder climate with harsh winters (Amiot et al., 2011). Many dinosaurs in that region had filaments and other protofeather like structures (Amiot et al., 2011). Perhaps Yutrannus needed protofeathers for insulation, whereas T. rex did not need it. Another main difference is all of the related Tyrannosaurs that had feathers are much older than T. rex, they are all from the Early Cretaceous. Tyrannosaur relatives from the Late Cretaceous all have preserved skin impressions that clearly show scales (Bell et al. 2017). Perhaps Tyrannosaurs lost their feather like structures by the end of the Cretaceous. Finally, Carr et al. (2017) took a different approach and studied the bony texture of a skull of a new species Daspletosaurus horneri (A closely related Tyrannosaur). The type of texture on the skull bones indicate they were covered in scales. Carr et al. concludes this dinosaur and other Tyrannosaurs had scaley faces. What does this all mean? This shows that T. rex was either fully scaled or at least mostly scaled. The possibilility that T. rex supported feathers in only certain areas cannot be ruled out, or that babies and juveniles had feather structures but lost them as they aged. More skin samples are required before this question can be fully answered. This video below from the American Museum of Natural History shows the behind the scenes story of the museums T. rex makeover. They give the adult T. rex feather like structures in a few select areas and also fully cover their baby T. rex in down. It looks so cute! 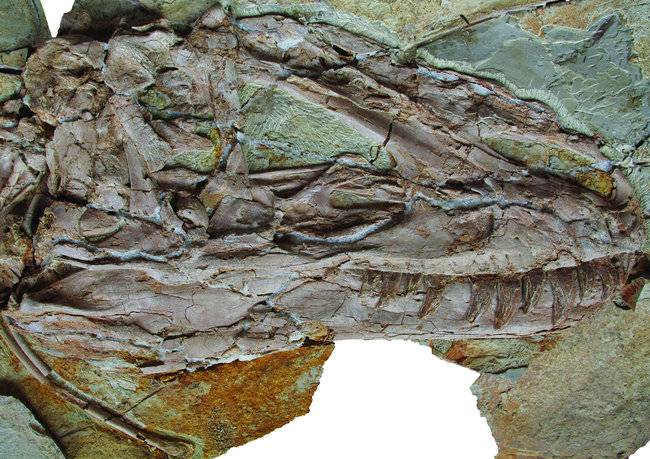 Specimen ZCDM V5000, the holotype Yutyrannus huali. 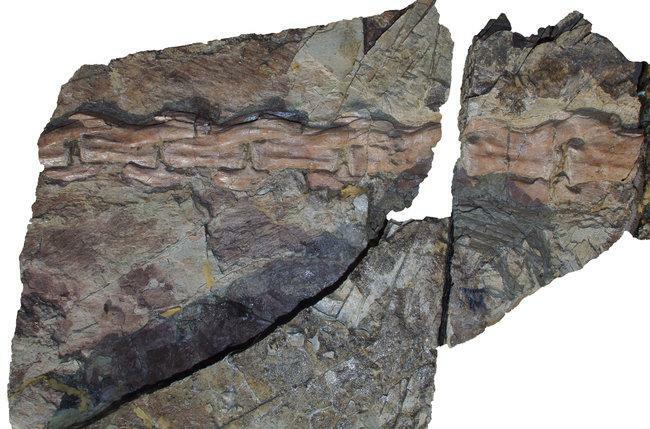 This image shows part of the tail section of the fossil. The faint feather strcutures can be seen here. Image by Zang Hailong. Specimen ZCDM V5000, the holotype Yutyrannus huali. This image shows the skull. Image by Zang Hailong. This is one of the few adult books out there about T. rex. This true (non-fiction) story plays out like it could be made into a movie. It discusses "Sue" one of the most famous Tyrannosaurs. After the discovery, a battle began over the fossil. The battle was between commercial fossil hunters, corporate giants, major museums, law officers, government prosecutors, and a Native American tribe. This intriguing book is written from Peter Larson's point of view, and covers the events in wonderful detail, including the government raid into the Black Hills Institute. It's a must read for anyone interested in Tyrannosaurs and interested in the corruption and ignorance that goes with a seemingly benign branch of science. This is one of the best Tyrannosaurus rex books out there. It is a collection of everything T. rex, from it's range based on stratigraphy, why it has short arms, to soft tissue reconstruction. It includes many tables, drawings, and photographs. The book also comes with an accompanying CD. The CD has loads of images and animations, including a simulation of the famous T. rex, Stan. This is a wonderful resource for all things T. rex! The book is, however, very technical and not for the casual audience. If you are a T. rex enthusiast, this book is for you. This is a 3 foot, true to scale, Tyrannosaurus skeleton with 51 realistic pieces. This is one of the most realistic replicas I have found on the internet. It's an awesome educational piece for any T-rex fanatic, young or old! T. rex is so popular it's hard to imaging you can actually have a real tooth from one! Tyrannosaurus teeth are not that common. Usually you can find teeth from its distant cousin Carcharodontosaurus for sale. However, Fossil Era has a selection of real Tyrannosaurus teeth. Check 'em out! Want to find your own Dinosaurs? T. Carr, D. Varricchio, J. Sedlmayr, E. Roberts, J. Moore. (2017). A new tyrannosaur with evidence for anagenesis and crocodile-like facial sensory system. Scientific Reports. 7. 44942. 10.1038/srep44942. Farlow, O. James, Brett-Surman, M.K., Editors. (1997) The Complete Dinosaur. IN: Indiana University Press. Fastovsky, E. David, Weishampel, B. David (1996). The Evolution And Extinction Of The Dinosaurs. NY: Cambridge University Press. Cooper, S.M., Holekamp, K.E., Smale, K. (1999) A seasonal feast: long-term analysis of feeding behavior in the spotted hyaena. Crocuta crocuta (Erxleben). Afr. J. Ecol. 37, 149-160. Forster Catherine A. (1996) Species resolution in Triceratops: cladistic and morphometric approaches. Journal of Vertebrate Paleontology, 16:259-270. Lipkin, C., & Carpenter, K. (2008) Looking again at the forelimb of Tyrannosaurus rex. In: Tyrannosaurus rex, the tyrant king. Larson, P. & Carpenter, K. (eds.). Indiana University Press. Bloomington, IN. pp.167-190. Ostrom J.H, Wellnhofer P. (1986) The Munich specimen of Triceratops with a revision of the genus. Zitteliana. 14, 111-158. Rothschild, B. M. & Molnar, R. E. (2008) Looking again at the forelimb of Tyrannosaurus rex. In: Tyrannosaurus rex, the tyrant king. Larson, P. & Carpenter, K. (eds.). Indiana University Press. Bloomington, IN. pp.287-304. Rothschild, B., Tanke, D. H., and Ford, T. L. (2001) Theropod stress fractures and tendon avulsions as a clue to activity: In: Mesozoic Vertebrate Life, edited by Tanke, D. H., and Carpenter, K. (eds.) Indiana University Press. Bloomington, IN. pp. 331-336. S. Wroe, D. R. Huber, M. Lowry, C. McHenry, K. Moreno, P. Clausen, T. L. Ferrara, E. Cunningham6 M. N. Dean, A. P. Summers. (2008) Three-dimensional computer analysis of white shark jaw mechanics: how hard can a great white bite? Journal of Zoology. Volume 276, Issue 4, p. 336-342, December 2008. Xu X., Norell, M. A., Kuang, X., Wang X., Zhao Q., & Jia C. (2004) Basal tyrannosauroids from China and evidence for protofeathers in tyrannosauroids - Nature 431 (7009): 680-684. The Bizarre story of the Discovery and Rediscovery of T-rex! There were more tyrannosaurs than T-rex. Check them out! Your Guide to Triceratops, the main food source of T. rex! The Largest Theropod to ever exist! It's also the First Semi Aquatic Dinosaur! Why the difference in East and West Coast Cretaceous dinosuar of North America? A trip to the Hell Creek in search of Dinosaurs! During the Cretaceous, T. Rex may have ruled the land, but Mosasaurs clearly ruled the seas!